The Plunket Society had been in Cambridge since 28 September 1917. The Independent reported – “A large number of ladies (and several babies) assembled in the Council Chamber”. They formed a sub branch of the Hamilton Centre and Nurse Graham travelled to Cambridge every Friday attending mothers and babies in their rooms in the Priestley Building. That first year 227 adults and 127 infants visited the Plunket rooms, as well as Nurse Graham visiting 32 homes. In August 1919 Nurse Goulstone became Cambridge’s first resident Plunket Nurse and she visited homes on a bicycle. In 1923 the Cambridge Branch was formed, covering Morrinsville, Matamata and Putaruru. On 20 March 1930, after a successful Queens Carnival, enough money was raised to open Rest and Plunket Rooms in Victoria Street (on the present site of AMI Insurance) next to the former Post Office. Described as up-to-date, beautiful and convenient they were built by Speight, Pearce, Nicoll and Davys for about £900. The building had a brick base, roughcast top and a tiled roof. From the entrance was a large waiting room with the Plunket rooms on the right and to the rear conveniences and rest rooms. At that time the Nurse’s wages were £18 6s 8d a month but as the coming depression deepened in the 1930’s her wage dropped to £15 7s 2d. On 3 February 1931 the Waikato Independent reported – “At 10:45 this morning residents of the district were startled by a prolonged earthquake, followed ten minutes later by a second tremor. The visitation was most pronounced and was felt throughout the district”. The first shock lasted 45 seconds and some people went outside for safety. Suspended items such as light fittings and doors swung as the buildings moved with the waves of the quake. Moveable objects rattled, teapots etc crashed to the floor. In the afternoon the local residents were sceptical regarding the reports and rumours that Napier and Hastings had been left in ruin by the quake. Soon the interest turned to concern as the extent of the damage was revealed. Telegraph communications were gone and radio reports coming through were eagerly sought. Ethelwyn Norwell nee Chellew was at her counter of the French Glove House in the Hannah Buildings in Napier on 3rd February. Suddenly she was thrown in the air and landed on her knees. This happened again and again. All the shelves emptied and concrete and dust was coming down from the floor above. Ethelwyn had been brought up with earthquakes and knew what was happening. Climbing over the rubble she had to get outside. All the street lamps were down and the power wires were left hanging. The second quake struck and the next thing Ethelwyn knew she was covered in blood. The blood wasn’t hers – although she cannot remember she had rescued a young girl from a nearby building. Her main concern was to find her father. Stepping over bodies she wandered along the Parade, she saw no one she worked with. Someone had a battered bucket and a cracked cup and people queued for a drink. When her father came they walked home. The parks were used as hospitals. Bodies were laid out on the ground. Ethelwyn’s uncles arrived from Wellington and set up a Salvation Army depot in their home. The women and children left the area and the men stayed to help with the clean up. Later Ethelwyn’s husband Leslie Norwell was one of the architects who designed the now distinctive Art Deco buildings in Napier. He also designed the wellknown stylised Norfolk Pine used on all Napier’s promotional material. In Cambridge, news of relatives was eagerly sought. Rev James Hay accompanied by Tom Richards left for Napier to bring back relatives. They left with a carload of foodstuffs and other goods. Cambridge people gathered sacks full of clothing and sent them off to the stricken area. In three weeks £1,069 18s 6d had been raised for relief. This was the time of the world-wide depression. In 1931 a subsidy of £1 for £1 was given to Local Bodies by the Government under the No 5 Scheme. Unemployed (130 men were registered locally) were used in Te Koutu Domain when the lower flat, tennis court and railway areas were all cleared of weeds and burnt. Raupo heads were cut from the lake, and the ground by the gasworks was cleared ready for planting gums and pinus insignis. Several sharp bends on the back road to Roto-o-Rangi were straightened as well as work on roads in the Hautapu district. At Fencourt and Hautapu drains were cleaned and deepened, and around the Leamington Cemetery gully the weeds were cleared from the young trees. By April 1931 there were 207 men on the local unemployed list as the work on farms dropped off. 20 men were found work at the Arapuni Dam. By June 40 had moved from the district to try their luck elsewhere. In 1933 the Public Works set up camps for unemployed people to metal the roads, and a road tour by the Matamata County Councillors found that the Te Miro Road was generally voted to be the worst. It was at this time that the farming district of Kairangi was founded. Daniel Bryant’s solution for unemployment was to buy unused farmland and set the unemployed and their families to work breaking in the land. It worked. In February 1931 the Cambridge Domain Board was asked for permission, by the Tennis Club, to play tennis on Sundays. The local ministers finally agreed so long as the games did not clash with their services. But the Domain Board would not hear of it, even though golf was played on Sundays. They thought if tennis was allowed then bowls and croquet would also want to play on Sundays. At the next meeting they found it was not in their jurisdiction to stop tennis on a Sunday so the games went ahead. In March 1931 the Leamington Bowling Club was opened. The Alpha Lodge (in Cambridge since 1883) opened new premises on the corner of Bryce and Queen Streets in June 1930 and the new solid style of Art Deco started to show on Cambridge buildings. The Anglican Parish Hall was completed in 1931 through the money raising efforts of Mrs Sarah McCullagh and the work of the Ladies Guild. It was built by Speight Pearce Nicoll Davys from the plans of T S Cray for £2,160 and consists of rough cast reinforced concrete with ornamental buttresses and panels, similar to the Alpha Lodge. The windows are diamond shaped leadlight, and above the front door on the spandrel is designed the Arms of the Diocese and St Andrew’s Cross on shields. In 1931 Miss Frances Davies also contracted SPND to build on the corner of Victoria and Alpha Streets. The shell, steel window frames with leadlight windows and ornamentation with the face peering from the wall, is a beautiful addition to the Cambridge scene. In the same year Harry Webb built his butchery next door as did E J Easter (Health 2000 Store). This building has also retained its leadlight windows, tiled entrance and interesting pressed zinc verandah ceiling. Today’s Toyworld building was built in 1930 along with E H Leigh Chemist in Victoria Street and Betts Butchery in Duke Street built in 1937, thus doing away with most of the original wooden buildings. In February 1932 a new style of grocery store arrived – the Self Help. The Hawkes Bay earthquake in February 1931 accentuated cracks in the Post Office tower. The chimes were stopped and later in the year it was decided that the clock had to come down. 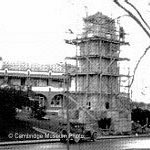 Architect Harold White designed the new Clock Tower in Jubilee Gardens which was erected for £655 by S P N D. The clock, originally supplied by Littlejohn & Sons of Wellington in 1908 was reinstated and Mrs Edith Priestley (the wife of the Mayor) officially restarted it at 3pm on 5 October 1934. St Peters Private School on Hamilton Road was built in 1936 and in Duke Street in 1937 Wilkinson and Co, the Ford Motor Car Agents, re-modelled their premises with new showrooms and offices. Upstairs was a lounge and dark room where movies were shown of the manufacture and special features of the new Ford cars. The St John Ambulance Brigade was inaugurated in Cambridge in 1932 and formed on 1 May 1933 with Mr Glanville the Superintendent and Mr Charles Boyce the first chairman. Lectures were given by Dr Norman Waddell. December 1938 saw the opening of a new depot for the St John Ambulance in lower Victoria Street (now Vodafone) after a special appeal to the public for funds. It contained a garage for the ambulance, lecture room and headquarters for the brigade and cost £556. On 13 May 1933 the Calf Club was formed in two sections – Cambridge East and Cambridge West. Judges were John Fisher, Albert Peppercorn, Robert Wattam and ‘Willie’ Wallace. The first rules stated calves were to be born between August 1 and September 15 and that only grade heifer calves were eligible. A year later the children were required to keep a notebook on the progress of their work. Lambs and home gardens were introduced in 1937 and the name became ‘Cambridge Boys’ and Girls’ Club’. The fire of Richards Grocery Store in January 1935, was very spectacular. It started about 9:30am. Willing hands only had time to save the record books before black smoke and flames drove them back. The fire brigade was quickly on the scene but in ten minutes the fire, fanned by a strong wind was an inferno. A lady standing across Victoria Street had her dress set alight by a flying ember but the flames were quickly smothered. The local fire brigade contained the fire to Richards Store and Litchwark’s Radio shop but T H Boyce & Co and Mrs Ray’s had considerable water damage. The building had originally been built on the corner of Thornton Road and Grosvenor Streets as the Baptists’ Tabernacle in 1883. It was moved to Victoria Street (The Prince Albert now occupies the site) in 1893 and used as the Oddfellows Lodge until it was bought by Charles Boyce. He turned it into the Alexandra Hall which was used for meetings, socials and the first picture shows. About 1915, T F Richards bought the hall and turned it into a grocery shop. After the fire, seven Cambridge business people got together to form The Cambridge Theatre Company. Speight, Pearce, Nicoll and Davys started to build the Tudor Picture Theatre in Victoria Street in November 1936 for the tender £6,000. The Cambridge Theatre Company leased the building to Amalgamated Theatres Ltd who opened in the new building on Friday 30 April 1937. They showed ‘Rainbow On The River’ with Bobby Breen, May Robson and Charles Butterworth. At the time it was considered one of the best country cinemas in New Zealand. Jean Blackett nee Cooper was an usherette and worked Monday to Saturday from 6:30pm to 10pm for 12/6d a week. She ushered patrons to their seats and put the seats down for them. During the pictures she adjusted the sound with a button downstairs, then afterwards tipped all the seats up again before going home. In 1935 the Maungatautari No 2 School was running smoothly. The committee allowed swimming during hot afternoons and the annual picnic was held in Mr Scott’s bush. Pine trees were bought to provide shelter around the school; cocoa and sugar was bought for the children in the winter. Mr Irvine the bus driver was advised he was not to carry corpses in the bus and the committee repaired the school clock, had a book shelf erected and made plans for extensions. By 1936 the population in Cambridge was 2,199 and including the districts totalled approximately 5,000. In August 1936 Cambridge celebrated the Borough Council’s 50th Jubilee. The first official function was a special meeting of the Borough Council held on the stage of the Town Hall when the Minutes of the first Council meeting, held on 7 September 1886 were read and confirmed. Mr Arthur Bach, the oldest surviving mayor of Cambridge, presented Mr Charles Priestley, the current mayor with a gold Mayoral Chain of office bearing the names of the 15 previous Mayors. (This had been purchased by public subscriptions). Accepting the chain Mr Priestley said it would be his earnest endeavour to carry on the good work in the interests of Cambridge on standards set by such former Mayors as the late Thomas Wells and W F Buckland. At the entrance to the Cambridge Bowling Club on Thornton Road is the gateway erected in 1936 to commemorate the Borough’s 50th Jubilee. The Begonia House, further along Thornton Road was erected to mark the Borough’s 100th Jubilee in 1986. The schools took up planting trees on arbor day and in 1939 the Council planted oriental plane, Spanish chestnut and silver birch on Hall Street between Hamilton Road and Clare Street. In 1940 the Country Women’s Institute made a special New Zealand Centennial effort with plantings in Victoria Street from the Technical School (by the Cambridge Museum) to the Victoria Bridge. A further nine houses in Grosvenor Street were nearing completion and were fitted with gas stoves. Another nine were started in Bowen Street. 1938 was the first season of the Bobby Calf Pool and 21,000 calves were handled with the average payout of 7s 2½d. The object of the pool was to rationalise the collection and delivery of calves to the freezing works at Horotiu and co-operative marketing. 7 November 1938 marked the beginning of free milk in schools. The contractor, Mr G H Worms, had his farm and factory at Karapiro and delivered 800 bottles to the Cambridge, Leamington, Hautapu, Goodwood and Convent schools and Miss Brann’s Kindergarten just before 10:30am. The scheme proved very popular with most children – the idea was to improve children’s health. The milk was drunk through straws pushed through a small hole in the cardboard cap. Slogans were painted on the bottles – “Active Minds, Active Bodies, Milk is Good for Children”, “Drink Milk and Get Big and Strong”, “Top of the class; Milk for Growing Children”. The empty bottles were returned to the factory where they were cleaned by revolving brushes and sterilised ready for use again. In 1966 Dr Neil C Begg, director of medical services to the Plunket Society, was advocating what a backward step it would to abolish free milk in schools but, in February 1967, the government stopped the scheme. In 1939 the 2nd World War reached Cambridge. Archie Shaw was one of four New Zealanders in H M S Archilles, killed during the Battle of the River Plate, with the Admiral Graf Spee, off Montevideo on 13 December 1939. In 1940 four of his school mates H Petersen, I Litchwark, H Filleul and J Brett organised the fundraising for the Shaw Memorial Cup, awarded to the best all-round boy at the Cambridge High School.